The Company state was in the middle of a rapid transformation in the 1790s. It was to be engaged in wars, with local rulers as well as in the broader global war with the French, for the next quarter century. Starting with Cornwallis’ wars with Tipu Sultan followed by Wellesley brothers’ wider conflicts across India and the Anglo-Maratha wars, the wars expanded the Company territories across the Indian peninsula and established the Company as the preeminent power in India. There were other changes equally as significant: The rise of evangelical christianity and the English nationalism rekindled by the French wars led to a separation between the English and the Indians in a much greater degree. Cornwallis’ administration had excluded Indians from all important government positions. The more moralistic positions of these administrations discouraged gambling, drinking, cohabitation with Indian women and embezzlement of government funds. Also, the conflicts between Indian and English traders led to a decline of social contacts between the English and Indian residents of Calcutta and hardened the inter-community barriers. However, there was one area such separation was transcended and a new possibility of scholarly collaboration was conceived. Pitt’s India Act of 1784 required East India Company to train its officials before they were employed in India. This was taken up Lord Wellesley, under whose administration Hastings’ visions of ‘a great empire’ was being militarily realised (and whose brother Arthur, the future Duke of Wellington, was modernising the training and logistics of Company’s Indian army at the same time). Wellesley’s idea was to build an institution for the company employees, most of whom arrived in India relatively young and without any formal instruction. Wellesley’s project, to build a college ‘comparable to Cambridge and Oxford in size and in the diversity of means it offered for enriching the intellect’, was meant to build character and prepare these young men to not to succumb to the ‘moral depravity and indolence’ of the life in India. Fort William College, as the institution came to be known, was remarkable in its scope and conception. Professorships were to be established “as soon as may be practicable and a regular course of lectures commenced”. Besides Arabic, Persian and Sanskrit, six Indian “vernaculars” would be taught. Muslim and Hindu law would be studied, as well as English law, jurisprudence, and the laws enacted by the Governor-General-in-Council. A course of political economy was visualized similar to the one that Malthus would later teach at Haileybury. World geography and mathematics would be offered. The modern languages of Europe as well as Latin, Greek, and the English classics would be provided for. Wellesley not only saw the need for courses in ancient and modern European history but organised a course in cooperation with the Asiatic Society of Bengal called the History and Antiquities of Hindustan and the Deccan. Finally, included among the sciences were natural history, botany, chemistry, and astronomy. Wellesley’s project was lauded for its impact on later revival of Bengali literature and culture: Bengali was one of the “vernaculars”, along with Hindustani, Telegu, Marathi, Tamil and Kannada, offered in the college. The college also brought together Indian and English scholars and provided the much needed fillip to the works of the Serampore Mission of Carey, Ward and Marshman. 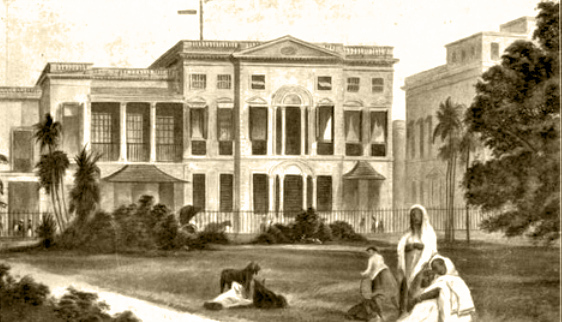 This institution, ‘Oxford of the East’ as Wellesley would call it, was to provide the model for Serampore College, the first degree-granting European style college in Bengal. However, the significance of the Fort William College in the context of the present narrative is not what it did, but what it did not become. Wellesley’s project was a stillborn, despite his spectacular military successes and decisive victories over Tipu Sultan in Mysore (where, after Tipu’s death, he restored, following the ‘ancient constitution’ of India, a Hindu dynasty). The apparent reason for this was his enthusiasm for India-built shipping, which put him directly at odds with the East India Company’s court and British shipping interests. East India Company’s court was resistant to any suggestions of opening up shipping and loosening its trade monopolies. At this time, the wars with France and disruption in British shipping allowed the neutral countries, such as United States, to expand its trade with Calcutta manifold. Wellesley and his advisors, supported by British merchants and shipping interests in Calcutta, weighed in on the free trade side, upsetting the Company Court. On the other hand, while important members of the Board of Control and British Cabinet were sympathetic to the cause of Indian shipping, they feared that the ‘literary and philosophical’ men that Lord Wellesley assembled at his college would make it a school of Jacobinism. This conflict between the India administration and the East India Court allowed Charles Grant to gain initiative and eventually the company chairmanship in 1805. From this position of influence, Grant superseded Wellesley’s plan by incorporating the European part of curriculum planned for the Fort William College, as well as taking over the responsibility of employee orientation, into a newly formed company institution situated at Haileybury in Hertfordshire rather than Calcutta. This arrangement, which put Cambridge Anglicans in charge of moral and intellectual preparation of future company officials rather than leaving it in the hands of Calcutta authorities with suspected ‘orientalist’ leanings, satisfied evangelical sensibilities. After a brief period of prosperity (1800 - 5), the Fort William College was left as a rump institution devoid of its Liberal Arts aspirations and limited to the task of familiarising employees with the specifics of Indian administration. Fort William College’s legacy has been much discussed in terms of its impact on vernacular scholarship, but non-being of its expansive aims are just as significant: The aborted ambitions of establishing a centre for Liberal Learning would be revived later under private agency, most notably in Hindoo College in Calcutta, but the ideas of ‘Oxford of the East’ would play no part in conceptualising the University of Calcutta half a century later.